In ,,In Memoriam Jon Higgins" by Alvin Lucier, the vibrations of a stable clarinet tone meet those of an electronically generated, imperceptibly upward sweeping sine wave. The concurrence of these waves produces beats. They are produced neither by the clarinet, nor by the sine waves. What happens here happens all by itself: in between. 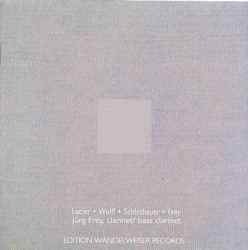 Christian Wolff discovered early on that every series of sounds sooner or later takes on the character of a melody; that is, appears somehow as a coherent movement. This ,,somehow" characterizes his music. Somehow his pieces are always melodies.They are always derived somehow from existing songs. And time and again there are noises which somehow belong to them as well. In ,,aus atem" (out of breath), Burkhard Schlothauer is searching for the millions of tones one can find between noise and sound - preferably static tones, which should not exist as anything but living material. In order that these can receive the same attention, there is space to forget before or after the tone. Melody also continually springs up in Jürg Frey's compositions. lt appears as though he is having a nearly silent conversation with melody. As if he wishes to explain to melody, which would love to talk, that it is ,,spoken by being silent". ,,But how", melody asks, ,,being silent? ".The composer leaves the answer up to her. She is silent by speaking in silence.